Caption slip reads: "Photographer: Wesselmann. Date: 1958-01-09. Reporter: Coart. Assignment: Herman Hover in jail. 45: Herman Hover, left, at Beverly Hills jail, with Captain Horace Brown, Junior, who bailed him out on an assault and battery charge. 25: Policeman M.L. 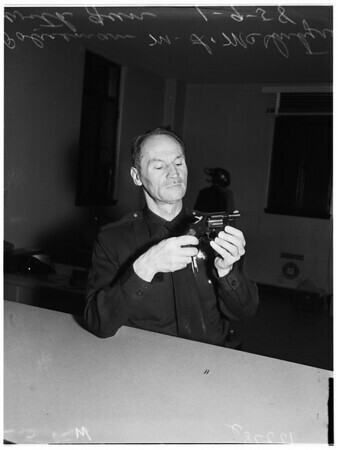 McIntyre holds gun Doctor Dan Weller is said to have attempted to use on Herman Hover to defend himself".